Festival: 2-9pm Wine Walk 4-8pm- GET YOUR VIP or WINE WALK TICKETS by Clicking the Register NOW button below! Online Ticket Sales are closed. If you would like VIP Tickets call us at 972-723-8600 until 4pm. All Wine Walk & VIP tickets will go on sale tomorrow at the Festival between 3:30pm & 7:30pm at the Chamber of Commerce Booth on 8th & Ave E. Come join the fun! Please note there are no refunds on Wine Walk Tickets! Join us on 8th Street & Ave F in Historic Downtown Midlothian! The Festival is FREE from 2-9pm, Join the Wine Walk from 4-8pm for only $25 which includes 12 Wine Tasting tickets, Shopping Tote and Wine Glass. 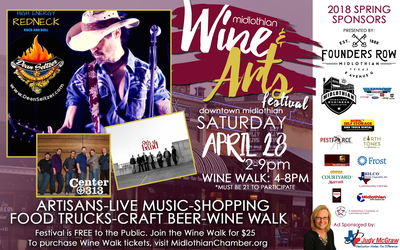 This is a great time to gather your family and friends for an evening of live music, food, art, shopping & wine tasting from premier Wineries and amazing Artisans. This is an outdoor event so plan accordingly for inclement weather. No refunds will be issued due to the weather. Pick your tickets up at the Chamber or the day of the Event at Chamber booth located at the corner of Ave F & 8th St. Vendor & Sponsorship Information: CLICK REGISTER NOW above to find booth spaces, booth pricing, sponsorship opportunities and to register. If you cannot register online, call the Chamber office for assistance (972) 723-8600. To join Wine & Arts please look below Event Description or click the Register Now button on the top left of this page.